View an online preview from Wisdom Publication's website. 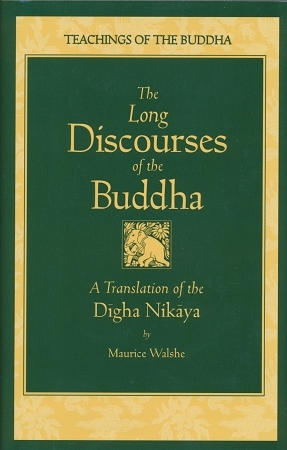 A new translation of the Digha Nikaya, a collection of thirty-four long discourses given by the Buddha. These suttas reveal the gentleness, compassion, power and penetrating wisdom of the Buddha. Included are teachings on mindfulness (Mahasatipatthana sutta); on morality, concentration and wisdom (Subha sutta); on dependent origination (Mahanidrana sutta); on the roots and causes of wrong views (Brahmajala sutta); and a long description of Buddha's last days (Mahaparinibbana sutta). "Dr Walshe's .... fluent, readable style makes these scriptures highly accessible to readers put off by the ponderous and sometimes archaic renderings of more academic translations" Bhikkhu Bodhi. Even though one has access to the Sutta Pitaka online, there is value in learning how to find Suttas within a bound volume. Also, finding them within a context is helpful to understand larger themes. (This applies to the MN, SN, AN, and the KN).